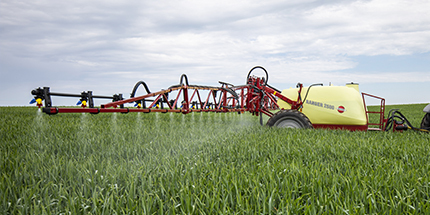 Good sources of information on how agrochemicals should be applied are often found on the agrochemical label. 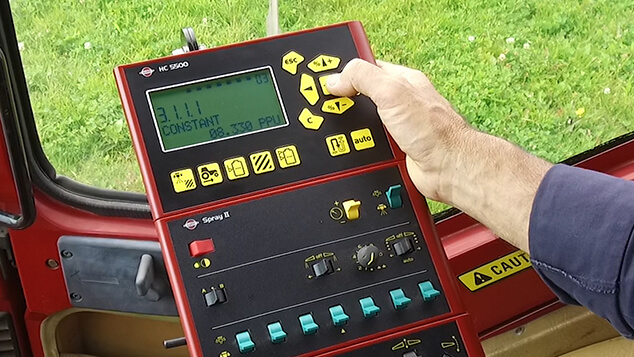 You may still need to adjust your sprayer to the specific spraying conditions you choose for volume rate, driving speed, nozzles and spray pressure. 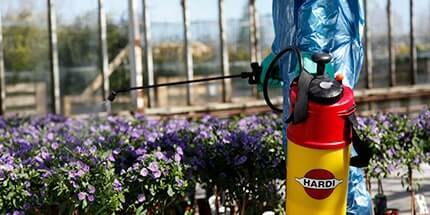 1) Half fill the spray tank with water. 2) Mark out 100 m – note time to drive the distance. 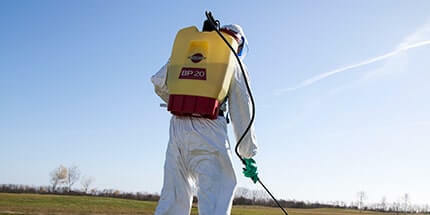 Example:If it takes 50 seconds to drive 100 metres then the spraying speed is 7.2 km/hour. Example: By aligning 150 l/ha and 7 km/h on the calibration disc the line in the "window" (l/ha) shows that we need a flow of 0.875 l/min. Then a suitable combination of nozzle size and pressure can be found on the lower half of the calibration disc: ISO 025 at 2,3 bar (or ISO 02 at 3,6 bar). For many years, 7 to 8 km/h (or 4 to 6 km/h in dense crops where canopy penetration is needed) have generally been considered good practice. It is an option that is still of value today. 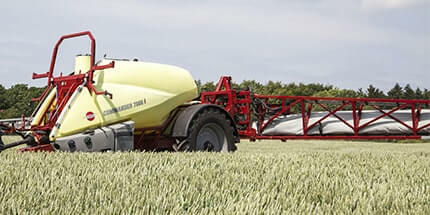 Increasingly, it is recognised that the slower the boom moves then the less turbulence it generates, and hence, less drift and less disturbance to the quality of spray distribution. 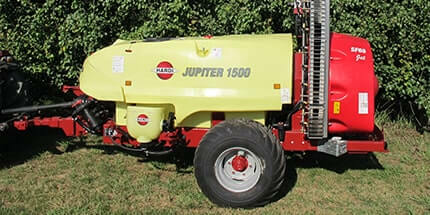 All agricultural nozzles produce a range of droplet sizes. 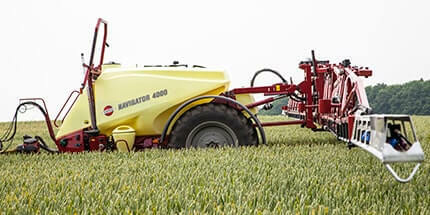 This is a useful feature as the crops to be sprayed always present a 3-dimensional target with contrasting leaf surfaces and angles. In a crop canopy, for example, finer droplets are likely to be deposited in the top and larger droplets lower down. 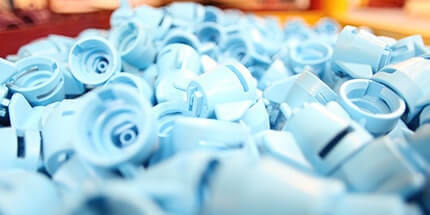 Drop sizes are measured in microns. 1 micron = 1/1,000,000 metre. To describe the median droplet sizes produced from a specific nozzle, the term VMD is used. 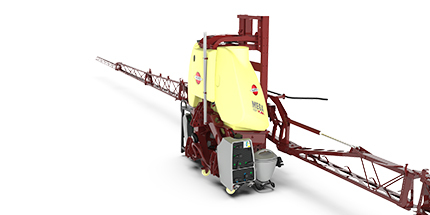 VMD is the mid-way drop diameter that is reached when the accumulated volume of smaller drops accounts for 50% of the sprayed liquid leaving the nozzle. In other words, half the volume is atomised into droplets with a diameter smaller than the VMD; and the other half of the volume is atomised into droplets with a larger diameter than the VMD. 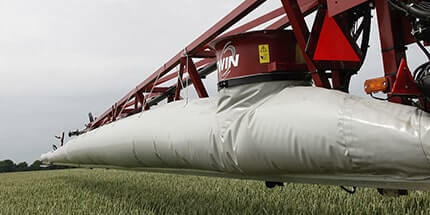 Wind drift is regarded as being mostly caused by droplets below 150 micron in diameter. 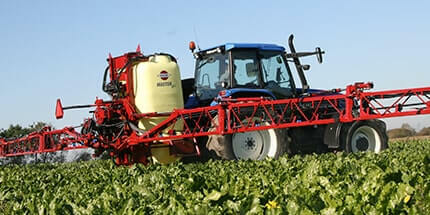 Pressure influences the spray angle: the higher the pressure the wider the spray angle. 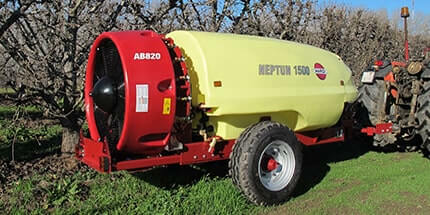 If the pressure is too low (below 1,5 bar for flat fans and 3 bar for INJET) the spray angle is not wide enough to ensure full overlap on the boom and optimum liquid distribution. The higher the pressure, the smaller the droplets and the more they are likely to be deposited within the upper canopy of the foliage. These smaller drops are also more sensitive to wind movement. 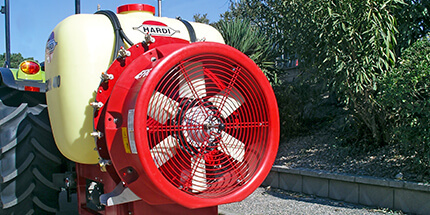 Pressures of 2 to 3 bar for normal flat fan and low drift nozzles are recommended for most applications. 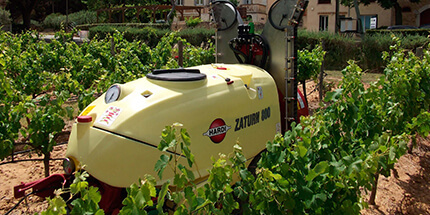 Only for well developed dense canopies where penetration is needed - such as spraying weeds that are concealed at the base of a vigorous crop - the pressure could be increased to 5 bar with larger nozzles (03, 04 and bigger). 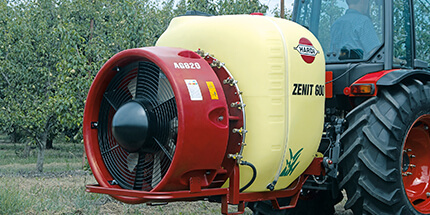 INJET nozzles require a minimum of 3 bar to have a full spray angle but can be used up to 8 bar. 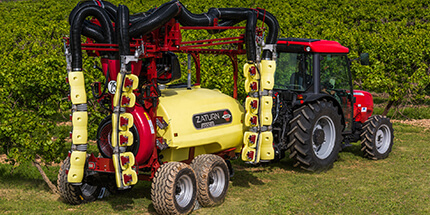 Be prepared to optimize your spraying technique 'on the go'. Rather compromise on drop size than timing. 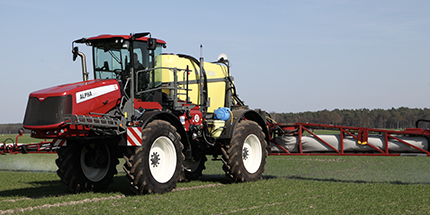 In many applications - from fungicide spraying in potatoes to dicotyledonous stage, broad leaf weed herbicide treatments -timing is very critical. 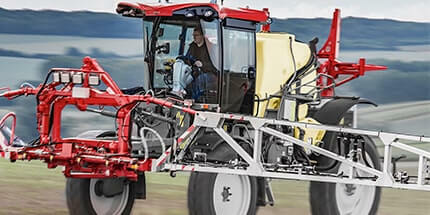 Any delay can create the need for a higher dose or an increased number of applications. 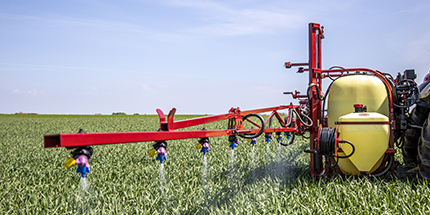 The potential efficacy loss due to an increased droplet size - that offers less drift risk - will be less dramatic, as long as a good liquid distribution is maintained. Hence it is a good idea to have a set of low drift nozzles or INJET nozzles ready on the nozzle holders in case wind speed increases. 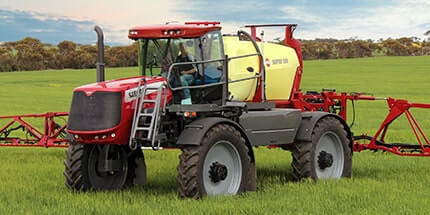 It is also a lot safer and more convenient than returning with a half full spray tank. Because there can be up to 10% difference in flow for new and worn nozzles both sets of nozzles should be calibrated - even if both sets are ISO nozzles.